Let me start off by saying that feet and arm pits are the two most disgusting parts of the human anatomy. Keep yours away from mine and I will keep mine away from yours. Deal? In the midst of all this running, I developed soreness in my middle toe on my right foot. Tripping on an uneven sidewalk was the initial blame so there was no major rush for me to get anything checked. A week passed and the pain was nagging me to the point it hurt to curl my toes. It was odd that I felt pain when I walked and not necessarily when I ran. I ignored it which is not always the best thing to do, and chose to complete the Passion for Life Race. Now that I need to almost triple my distance for 13.1 miles, I decided to visit a Podiatrist and get a professional diagnosis. I explained the problem and they took x-rays. 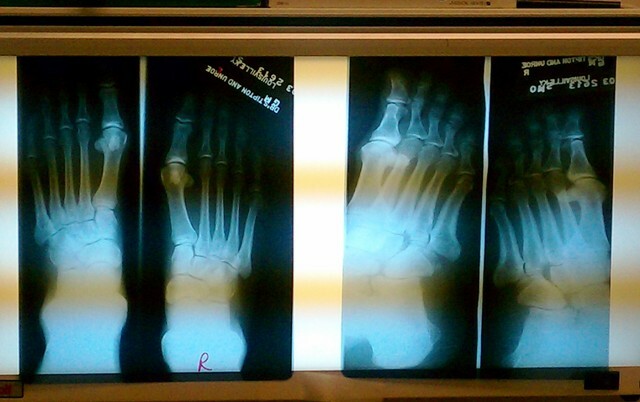 I wondered if the x-ray plates were disinfected from other’s feet. The thought of foot crust dust repulsed my neat freak nature. In walks the doctor and he told me he did not see anything causing soreness. He said if my pain was a 2-3 on a 10 point scale that I would be OK with taking an ibuprofen. I heard that I would eventually have to get my bunions worked on and when I do, have the 2nd and 3rd toes fixed. My Mother had the same procedure and I know she wishes she did it sooner. I won’t wait that long, but I’m not about to do it with in the next 5 years. They only swell up if I wear an ill-fitting shoe which I have gotten out of the habit of sacrificing comfort for style. I joked about my long toes and he added in by saying I am a dominant person because my second toe is longer than my big toe. I said “Oh, that’s E.T.” There was a time when I told my Mom I wanted my toes cut down to make my feet smaller and more attractive. I ran that by the doctor and he said it is possible, but not for cosmetic reasons. Next thing I know, the doctor starts adjusting my toes and mimicking what they do while I’m running. He demonstrates how my long phalanges bend in a way to give me “swan necks.” When he swan necked that middle toe, I flinched and said “Ow! That hurt!” He urgently said “I need to give you a cortisone shot.” Mention the word “shot” and I go into defiant, spoiled rotten mode. I am a sucker for pain. He numbed me and I had to wait a few minutes for the shot. I did not like this procedure and broke out into a cold sweat. The assistant saw my reaction and offered water. I told her “No thank you. I am just dramatic about this kind of stuff.” We all laughed and I went hopping home in my Cole Haan loafers. Mr. Podiatrist gave me some little cushion inserts for my Asics. In the end, I am glad it was nothing major. He said to take a day off from running and I will be fine by tomorrow. As I type this, the numbing agent has worn off. I popped two ibuprofens. My decision has not been made to skip the Papa John 10 miler and focus on the mini and another short race or just go all out and complete all 3 races over 4 weeks. Time will tell. This entry was posted in running, Uncategorized and tagged Morton's Toe, Podiatrist, Running pain. Bookmark the permalink. I can’t believe he gave you a cortisone shot!!! My podiatrist, knowing I am a runner, said when I tore my plantar fascia, that normally he would give his patients a cortisone shot, but that’s a suicide mission for a runner. So I went without and he put me on Mobic (anti-inflammatory). That also being said, my second toe is longer than my big toe too. 🙂 Which is why those toes always end up with the black tonails after my long races and/or hard runs. I’ve gotten used to those though. I hope you recover quickly and good luck on your decision on what to focus on for your racing needs. Personally…my focus would be on that half marathon. It’s the bigger and most important of the races. I think I’m running the Derby Festival Mini Marathon next year. This year though…I’m heading up to Minnesota for the Lake Minnetonka Half Marathon. Thank you for the feedback! I’ve read positive and negative reviews about cortisone shots. This was my first and hopefully my last. My toe is not sore at the bottom joint. Now its sore from insertion of needles! I was stuck twice for numbing and once for cortisone. It doesn’t hurt when I run. Its painful to curl my toes. My coworker who runs minis across the nation gave me a golf ball to roll under my foot. It’s soothing. I’m going to add more stretches and do boring yoga at least once a week. Presssing towards the mark with the 10 miler, especially since they extended the deadline. Have fun in MN! I think that’s the point. The problem with receiving a cortisone shot when you are a runner is that your body can’t relay to you if you are putting too much stress on it. That’s why he refused to give me one. He wanted me to know, when I was out there running, whether I needed to let up or stop. I roll tennis balls under my feet due to my torn plantar fascia last summer. It just feels good and helps with keeping the foot loosened up. I have to mind my pace at times because of it. Only you can know what is best for you, your body, and your foot. If you choose to do the 10-miler, I would encourage you to take it easier than normal and save the big push for the mini. 🙂 Either way…I know you’ll do awesome. You always do, girl. That totally makes sense. 🙂 @ The big push! Thanks!